The old tale is still popular that Wankel had invented his wonder-engine in 1919. It was always hard to believe how the 17-aged guy even very talented could invent such thing? To do such things you at least should have the finished university education and to learn how to design and draw… It’s more probable, that Wankel’s first drafts had appeared in 1924 when he had finished his higher education and was admitted to work in the technical literature publishing. When you overturn the heaps of literary trash it happens either you forever loose the interest to engineering or start to design on your’s own. Perhaps Felix was gifted to engineering. He had opened his own workshop in the Heidelberg and in 1927 the design of “engine with revolving pistons” (in German abbrev. – DKM) had came into the world. Felix Wankel had secured his first patent DRP 507584 in 1929 and in 1934 he had proceeded with a patent application for DKM engine. However he had secured the patent only 2 years later. At the same time in 1936 Wankel had settled in Lindau where he had placed his laboratory. Later the promising designer was distinguished by the authorities and he had to stop the works on DKM. Wankel worked for BMW Daimler and DVL – the leading air-engine producing enterprises of Nazi Germany. And it’s not surprising that till 1946 Wankel had to waste time in prison as the aider of the Nazi regime. The laboratory in Lindau was got out by the French and Felix simply was left with nothing. Only in 1951 Wankel got fixed up in job to motorcycle enterprise – by this time the world-famous NSU. During the reconstruction of his laboratory Wankel had interested in his designs Walter Froide, a designer of racing motorcycles. Together Wankel and Froide had rushed the project in company management and it was that had greatly accelerated the engine development. At February 1, 1957 the first rotary engine DKM-54 had started. It operated on the methanol fuel but by June the engine that had worked out for 100 hours on test bench was redesigned for petrol. Suddenly Froide had suggested the new concept of the rotary engine. In the Wankel’s engine (DKM) the rotor was revolving around the fixed shaft in block with combustion chamber that guaranteed the vibration-free operation. Walter decided to fix the combustion chamber and let the rotor to rotate the shaft, in other words he used the principle of dual rotation for the rotary engine. That type of rotary engine was called KKM. The principle of duality in rotation Wankel himself had patented in 1954 but nevertheless he used the principle of DKM engine. It should be noted that Wankel did not like the idea of such inversion but he had nothing to do with this because the maintenance of his favorite DKM engine was very labor-consuming and in order to change the spark plug the whole engine should be disassembled. So the KKM-type engine was more perspective. The first sample of it was put into work in June 7, 1958 (though the spark plugs still were mounted on the rotor as in DKM engine). Later the spark plugs were displaced to the engine case and it had jbtained the design that had not principally revised till nowadays. Now all rotary engines are based on that design. Sometimes such engines are called “Wankels” in honour of their inventor. In such engine the engine by itself plays the role of the piston. The stator serves as combustion chamber, it has the epitrochoid shape and when the rotor’s gaskets are sliding on the stator’s surface they create the cameras, where the process of fuel combustion takes place. During one rotor evolution such process happens 3 times and due to the special shape of the rotor and stator the engine cycle is the same as in ordinary internal-combustion engine – intake, compression, combustion and exhaust phases. The animated scheme of rotary engine operation you can look here. The rotary engine has no valve timing system – the role of timing system plays the engine by itself. Engine by its own opens and closes the ports in appropriate moments. It has no need in the equalizer shafts and the two-section engine is like the multi-cylinder internal-combustion engines according to vibration ratio. So the idea of the rotary engine in the late fifties seemed to be the step in the bright future for the automobile production industry. The post-war Germany began to become richer little by little and the cars were sold better and better. The NSU were working in this field and the cornerstone of its model line should have to be the Wankel’s engines. Since 1958 the works on the rotary engine car development had been performed and in 1960 the rotary engine was shown on the German’s designers conference in Munich. The car named NSU Spider was equipped with Wankel’s engine, which had power rating of 54 HP. Many people may smile but it was adequate for little Spider – it was able to accelerate up to 150 km per hour. The Spider was produced from 1964 till 1967. The main car that Wankel famous was the NSU Ro-80 shown in 1967. Even in product name it had leader pretensions – “Ro” means rotary engine and the “80” means something like “car of 80-es”. This car had established the new rules in sedan exterior design – clear body lines, high glass cover surface, the luggage compartment is above bonnet. The impact of Ro-80 design is could be noted in Audi 100. Small dimensions of rotary engine made it possible to make the front part of the car lower and narrower that resulted in decreasing by 25% of drag coefficient as compared to other cars in its class. This sedan had two-section Wankel’s engine with 2 x 2 x 497.5 СЃРј3 cubic capacity. This most perspective design has serious disadvantages which would be hard and expensive to neutralize. The combustion chamber of rotary engine has the elongated shape like the crescent of new moon. It is reasonable that thermal loss on the larger than of the ordinary cylinder surface area results in the higher heat load of engine and lesser efficiency ratio. No efficient air-fuel mixing is performed in such combustion chamber that results in low fuel efficiency and low ecological compatibility. From the technologist’s point of view the rotary engine is not the gift. Unlike the ordinary piston engines in which the fuel combustion process occurs alternately in adjacent cylinders and in the period between the strokes the combustion chamber is cooled by the fuel mix during the intake stroke, the rotary engine has the only one combustion chamber that is working permanently. That’s why the rotor should be resistant to thermal jumps then the heated surface is cooled by the fuel mixture on the next engine cycle. The second problem is the sealing. In the internal-combustion engines the piston rings are moving under the same working angle. In the rotary engine the rotor is slipping by its corners on the stator surface and the seals have to work on different angles. It is reasonable to reduce the friction by injecting the lubricating oil directly into the collector. That results in further worsening of ecology compatibility. And it should be noted that rotary engine simply can not operate on diesel fuel. It’s simply would not endure the work load typical to diesel engine. From the very beginning the works on the rotary engine development the NSU did not made secret from this. Any car manufacturer could buy the license to produce the new engine and the purchasers had appeared immediately. Namely Daimler Benz, GM, Mazda, Citroen, Toyota… Most of them tried to develop cheap and powerful engine but having faced with reliability and maintenance problems canceled the engine development. And the NSU had broken itself mainly due to maintenance problems. The inexperienced customers simply fatally overheated the engines, excessively overriding the engine rotation rate. The engine reliability on such conditions was dramatically low. Fuel crisis worsened the situation. The fuel consumption rate was for Ro80 15-17.5 per 100 kilometers. The financial problems leaded NSU to the trap which happened to be too deep for NSU and in 1969 Volkswagen swallowed it up with lock, stock and barrel. That fact putted an end to mass production of rotary engine cars in Germany. But engineering sample cars existed. The Mercedes Benz was working under the supercar powered by rotary engine. The engineering sample had appeared in 1969 and was driven by 3-section 600 cm3 rotary engine of 280HP power rating. The light-weight car with plastic body accelerated up to 257,5 and achieved 100 kmph speed in 5 seconds. One year later on the Geneva Motorshow the second generation C111 was shown into public. The car had the superstreamlined body for those days and its Cx was about 0.325. One more section was added to the engine and it had 350 HP power rate. The driver of that car could achieve the 300 kmph speed and due to redesigned and boosted case frame he had experienced deep pleasure of the car’s behavior in during turns. The second generation had accelerated even more fast for 4.8 second up to 100 kmph speed. The orange wedge-shaped car achieved the magical speed of 100 kmph and continued to accelerate further. The fans of Gulfwing already putted themselves into the waiting list for the new “Wing” but the Mercedes had no intention to manufacture the remakes of its legend. Those cars were designed to troubleshot of the new engine but even MB still could not solve the main trouble of rotary engine – its monstrous fuel consumption. That way the oil crisis stopped the German development line of Wankel’s engines. Designers over the ocean also looked at the Wankel’s engine. Chevrolet obtained the production license for the rotary engines and in 1970 had started the development of Corvette car powered by 2- and 4-section engines. The fiberglass concept with engine mounted onto base had accepted approval of Eddy Cowl the GM’s president in June 1971. A year after, in June 1972 Corvette with steel body and 2-section rotary engine was presented to the GM’s executives and was titled as XP-987GT. By the January 1973 the Corvette with 4-section engine also was ready and in April it was tested in the wind tunnel in California. Corvette with 2-section rotary engine of 266 hp power rating was shown onto public in September 13 1973 in Frankfort and its copy with 4-section engine and of 390 ph power rate was exhibited on the Paris auto show in October 4 of the same year. But on September 24 1974 Eddy Cowl had suspended the development of Corvette powered by Wankel’s engine due to the manufacturing problems. The German idea was appreciated in neighbored France. The French started to collaborate with NSU in 1964 by establishing the Comotor enterprise with German partner. In 1973 Citroen had finished the development of the new rotary engine and in 1974 the Citroen GS Birotor was launched into serial production. The car was equipped with 2-section rotary engine with 2 x 498 cm3 combustion volume, which had 107 HP power rating at 5500 rpm. The Wankel’s engine was supported by working mixture by 2 Solex carburetors. The cars was also equipped with semiautomatic gearbox and hydraulic suspension. When the engine is started, the Birotor is lifting over road (traditionally for Citroen) and looks alike full wheel-driven car. The saloon was finished in cloth and plastic and radio receiver, tinted windows and sunroof were options. In period from March till August 1974 the 750 Citroens with rotary engines mounted were released from factory. Additionally 93 cars were assembled till the end of the 1974 and during1975 year only 31 Birotor were discharged from the conveyor. It’s easy to estimate, that totally it was made 874 Citroen GS Birotor cars. In 1977 the manufacturer withdrew the rotary-powered cars to liquidation. Still about 200 cars survived, but most of them a not registered anywhere. The chance to find fully functional Birotor is most likely in France, though also they were sold in Sweden, UK, Germany, Denmark and Netherlands. But the most true and consistent admirer the Wankel’s idea had found in far Japan, where Mazda had a great need in fresh idea to rise above the others. At that time the Japan government bore the idea to unite all Japan automobile industry. They rejected this idea and that was right decision! The first Mazda’s car powered by rotary engine was coupe Mazda Cosmo Sport, the first engineering sample of it was demonstrated on the Tokyo Motor Show in 1964. In 1965 the pilot batch of 60 Cosmo was produced, but its mass production had started only in 1967. The Cosmo of series 1 was powered by 2-section Wankel’s engine 10A 0810 with the working volume 2x491 cm3 supplied with 2 Hitachi’s carburetors. These engine unit had the power rating of 100 HP and had accelerated huge car up to 185 kmph. The 4-gear manual gearbox and anterior independent suspension helped to drive the car. The first series was manufactured from May 1967 till June 1968, it had in total 343 car produced. The second series of Cosmo Sport was produced from June 1968. The car was equipped with 10A 0813 engine with power rating 128 HP, had 5-gear gearbox, more efficient breaks and 15-inch wheels (previous series was equipped with 14 inch wheels). Now Cosmo could achieve the speed of 120 MpH (or 193 km per hour) and the distance of 400 m was driven in 15.8 seconds. The renewed car can be distinguished in exterior according to enlarged “jaws” and to slightly enlarged base. 1176 cars were produced by June 1972 what is not bad keeping in mind the fact that it is hand assembled and 1 car per day production rate. At the same time, from 1968 till 1973 the rotary-powered version of Familia model was manufactured. The two-door coupe used the chassis from basic Familia, but had Wankel’s engine under the bonnet with power rate 100 HP of Cosmo model. The less power of 10A 0820 Cosmo’s engine is because the use of small size carburetor. To produce the cheap car cheap materials were used – for example the aluminum was substituted to cast iron. Nevertheless the engine weight had increased slightly, only for 20 kg and achieved 122 kg level. Familia R100 participated in 24-hour races of Spa and Le-Mans, where it had defeated to BMW and Porches 911. The third model was rear-wheel driven luxury-class coupe Luce. The front-engine mounted car with body design by Giujiaro was powered by 13A engine with 2 x 655 cm3 combustion volume that had 126HP power rating. Luce R130 was able to drive quarter mile for 16.9 second. This car was not supplied for American market. This car had been produced from 1969 till 1972. In the 70-es of the last century the Japanese mounted Wankel’s engines practically to all new car lines from Capella to pickups and minibuses. Namely in this decade the “RX” brand was born, that means for Mazda the same as “GTI” for Volkswagen. The rotary engine beat the competitors by all points but the unexpected financial losses made the executive to stop its use. In 1970 the substitute for Familia RX 100 had appeared. The new model Mazda RX2 was based on the Capella’s chassis with ordinary piston engine mounted. The customers had to choose between Sedan and coupe bodies, which were simply the modifications of the same version of Capella and could be distinguished only by nameplate. The main differences were hidden under bonnet. RX2 had engine version 12A mounted, which had 2 sections with total combustion volume of 1146 cm3. The Wankel’s engine had 130 HP power rating that resulted in good dynamics for the car weighted 1050 kg even for present time. Such “hot temper” of this car bring it the love of its fans. In 1974 a slightly improved engine was developed for Mazda RX2 that made it last till 1978 in production. Since October 1972 Mazda manufactured Luce Rotary, the large car that came to substitute Luce R130. It was available in coupe, sedan and station wagon body versions, had 4-gear manual or 3-gear automatic gearboxes that leaved an impression. The car was sold with 12A engine mounted, which had 130 HP power rating, but for American market it was exported with 13B engine series mounted under model title. RX-4. This rotary engine consumed less fuel and met the American exhaust requirements. The 13B engine had 110 HP power rating that resulted in good acceleration for the car with coupe or sedan body which had about 1190 kg weight. The station wagon car version was tested by the Road&Truck Magazine in 1974 and showed fair results in spite of increasing in weight up to 1330 kg. It accelerated to 60 mph in 11.7 seconds, and 400 meter it finished in 18 seconds, were showing the speed of 124.5 at the end of the test distance. The Magazine had noted lowered fuel consumption and put it in ten of “Best buy for $3500-6000” category. The car price was $4250 but such options as air-conditioner ($395) or automatic gearbox ($270) had required an additional payment. The car had been manufactured for 5 years exactly and in 1976 the body was renewed. Since 1974 the first and at that moment the sole pickup had been sold on US and Canadian markets. Mazda sold it exclusively on market over the ocean and on internal market it was not sold. The rotor-powered version differed from B series pickups and similar Ford Courier in the body design by enlarged bumpers, altered body lines, chrome-plated radiator disclosure and by round tail-lights. 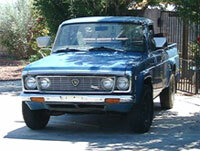 The Rotary Pickup had the well-known 13B engine under bonnet, which made the pickup to have slight sport-car temper. About 15000 cars were manufactured and most of them were sold in 1974 just before the fuel crisis. The crisis dropped dramatically car selling and cars of the 1974 model line were manufactured only about 700. Mazda had changed the car body design of 1977 model line, renewed the electronic equipment, substituted the gearbox to 5-gear and even increased cabin length by 10 cm for more comfort but all the effort were futile. And in 1977 this model was taken out of production. Since June 1974 Parkway Rotary 26 – the rarest model was manufactured, it was the only bus in the world with rotary engine mounted. It was equipped with 13B engine version with combustion volume of 2 x 654 cm3 that had the power rating already 135 HP and had low rate of harmful substances in its exhaust. This power unit was managed by 4-gear manual gearbox. The big bus (its dimensions were 6195 x 1980 x 2295 mm, and laden mass of 2835 kg) had easily accelerated up to its cruising speed 120 kmph. The nickname “twenty six” the Parkway had for its seating capacity – the standard DX version had 26 passenger seats onboard that exactly was shown in model title. The luxury bus version Super DX had only 13 passenger seats. This model was specified by low noise and vibration level in the saloon that was due to smooth work of rotary engine. Parkway could be equipped with air-conditioner on demand. Its production was stopped in 1976. In 1975 Holden, the Australian department of the Ford Corporation supplied to their Japanese colleagues Premier the presentation-class car for production under the Mazda brand. The production of that model was successfully started but Holden did not supplied it with engines that are appropriate for car that has 1575 kg weight and the Japanese adapted the 13B rotary engine for the bonnet of big sedan Mazda RoadPacer. Though it had more power rating than that of Holden’s engines the maximum speed rate had achieved 166 kmph the torque was obviously insufficient. The acceleration was low and the fuel consumption of its must be said high-consumpting engine was over 26 liters per 100 km. The car initially positioned as presentation-class car was released to market during the fuel crisis and accordingly had no market success. The unsuccessful RoadPacer was taken out of production after 3 years. The latest, third car generation – RX7 was thoroughbred Japanese sportcar. The 13B-REW rotary engine was mounted into the bonnet and the engine consisted of 2 turbines mounted one after another. The dual-turbine working scheme was designed in collaboration with Hitachi and had approved on Cosmo model that was sold on internal market. First turbine was smaller and started to work on low engine rate (from about 1800 prm) in order to avoid “turbine fall”. The second turbine was larger and started to work from 4000 rpm. Their joint operation was tuned up in the way that the torque always was sufficient. The FD platform was evaluated as the world class development level. The long-term work on the improvement of driving characteristics, perfect chassis, low gravity center and balanced weight distribution over axles resulted in very serious driver-friendly car. At present time only Mazda RX-8 is produced in stock. It has wonderful steerability and dynamics – it achieves maximum speed of 235 kmph and accelerates up to 100 kmph in 6.4 seconds. The new generation engine Renesis achieves power rate of 250 HP at 9000 rpm without turbocharger from 2 sections with total combustion volume 1598 cm3 and consumes surprisingly low fuel. The new RX-8 differs somehow from the legendary cars of the past. The ecological requirements lead to rejection of turbocharger use which made the previous motors tremendously powerful. Moreover, the Japanese tuning enthusiasts had achieved up to 1000 HP power rating increasing the supercharge pressure and the new motor does not allow such tuning. It is forced in another way by increasing the maximum rotation rate. Possibly it is the price for being existing of Wankel’s engine in the new, strange and obscure but the ecologic-friendly world. At the present time only Mazda officially performs the development of the rotary engines, it has the deep experience in this field. It was Mazda who proposed the idea to make operate the rotary engine on the hydrogen fuel making that way any exhausts impossible. Though the Renesis rotary engine operates using hydrogen its efficiency is as low as only 109 HP. But that is not a problem for the persistent Japanese. RX-8 still carries 2 fuel tanks – one for petrol and another for hydrogen. The Mazda car is powered by petrol on the route and within the city it operates on hydrogen; the switching between these 2 kinds of fuel is performed from the driver’s seat simply by pressing a button. http://iplogger.org/url-checker/ bulk http 301 and 302 URL redirect chain Checker.